As Americans, we are fascinated by war. While this idea may seem ridiculous to believe, war is an essential characteristic in the fabric of American life and society. World War I was no exception. Almost a century since our entrance to the war, it is still a topic of discussion among historians. How does war, especially World War I, remain prevalent? It was a war that transformed American society. Mass production and a new revolutionary culture that evolved out of the war keeps the legacy of our fight against Germany alive and kicking. We can look back on this period and see the rise and fall of American society and economy. Propaganda during war time created a community among Americans as they were solicited to support the war effort and defend the home front against Germany and the Central Powers. Not only did the economy grow, but Americans contributed to this growth. How did this happen? A simple answer: propaganda. In times of war, propaganda was used to recruit not only soldiers, but Americas as well. Propaganda painted a image of the enemy in numerous ways, such as villains, robbers of American freedom, or a threat of American society among other themes. As these images of were plastered around the country, the message was clear: we need to defend the country against the Germans. Avenge this!! Buy a Bond, Library of Congress, 1918. The country was needed to avenge the helpless countrymen by supporting the war effort. As stated by Eric Van Schaack, as the United States entered the war, Germany became our enemy. Propaganda produced at this time was able to take the vision of the Hun and capitalize on American fears of attack. In turn, government and agencies that produced propaganda turned these fears into a money making opportunity. The image of a dangerous Hun could easily be defeated if Americans bought war bonds. Propaganda depicted sometime violent images or outrageous caricatures; it was also used to appeal to people’s emotions, and in the words of Leslie Hahner, “patriotic hysteria.” Propaganda in a sense was a double-edged sword. On the one hand, our fears were exposed. Americans saw the dangers of the Germans and the threat they caused to American security and the home front. 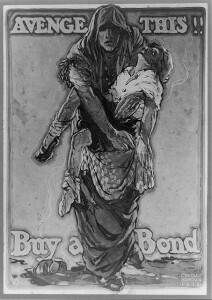 Government agencies that produced these posters and flyers played on the fear of Americans by showing what would happen if they did not buy bonds or support the war effort. On the other hand, these posters represented the formation of a nation against a common enemy. In this, there was a growing sense of nationalism. In times of war or tragedy, community members, Americans or the like, feel the same sense of tragedy and compassion. The nation is united against whatever enemy it is facing. Whether far or near, everyone shares in the same fear or enjoyment. Media and news are some of the main ways this sense of community is formed. In the case of World War I, propaganda also created this community. As reflected by Benedict Anderson, this sense of nationalism created a nation where it did not exist before. As Anderson explained, symbols such as propaganda created an identifiable marker in society that bound people together. 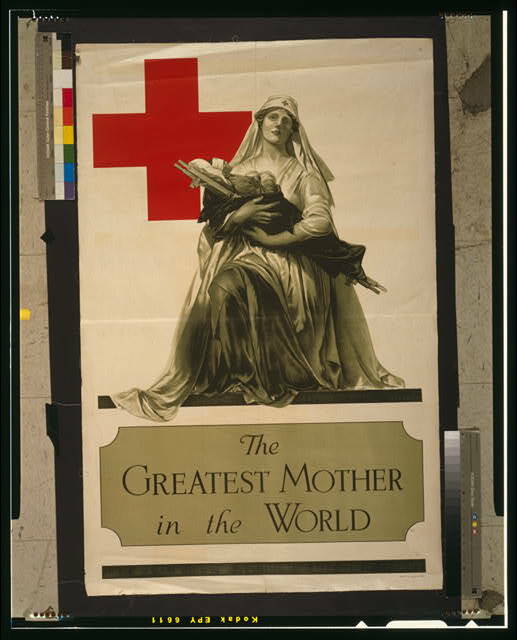 The Greatest Mother in the World, Library of Congress, 1917. This image reflects Anderson’s sentiments. This symbol of our “great mother” was just one image printed to create a sense of nationalism among Americans. They were able to turn to these images to feel proud of buying a bond and supporting the war. In addition, images also showed the necessity of support for the troops. Back them up. 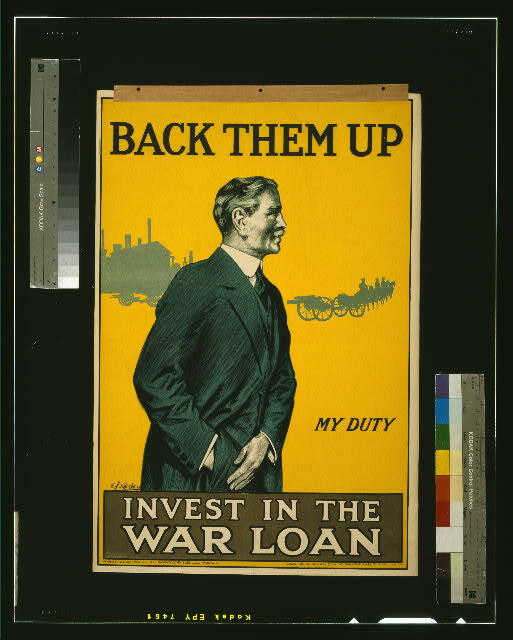 Invest in the war loan, Library of Congress, 1915. This image reflects this need to support the troops. What can be seen in this poster and posters printed throughout the war was a nationalist mentality that if we work together we can defeat the Germans. While life in America was full of fear and mass production and increasing prosperity, life in France also reflected this increased prosperity. Frank Steed, an Army clerk during the war, documented his travels throughout the country. His scrapbooks reflect a burgeoning art culture. Along with his Army documentation, he also has several opera tickets and ephemera. Among this, were numerous pictures of the Gaumont-Palace where it appears that many of these performances took place. At the time, the Palace was the place to be. Here is a brief video on the Gaumont-Palace. Like the United States, in France, there were symbols of a national identity. While there does not appear to be any evidence of why Steed took in so many shows it is interesting to examine the culture at the time. Propaganda continues to be relevant in American society in times of war and in general. World War I helped to created this national identity that we continue to remember 100 years later. Anderson, Benedict. Imagined Communities. London: Verso Press, 2006. “Avenge this!! 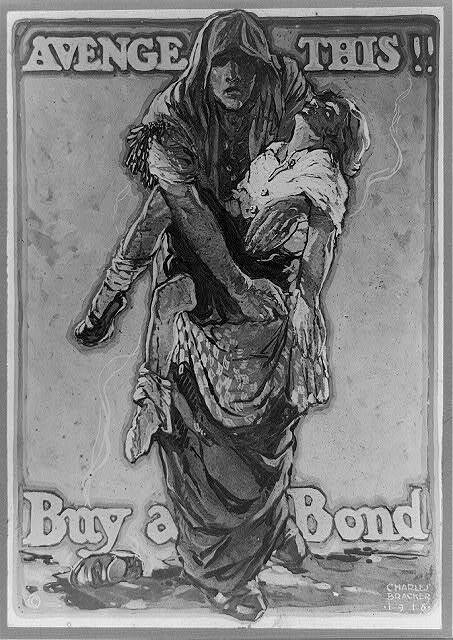 Buy a bond,” c1918, Library of Congress, http://www.loc.gov/item/2002718074/. “Culture : Le Gaumont Palace de Paris,” YouTube.com, https://youtu.be/h3TvGxiNvbY. Foringer, A. E., “The greatest mother in the world,” 1915, Library of Congress, http://www.loc.gov/item/2001700434/. Hahner, Leslie, “The National Committee of Patriotic Societies and the Aesthetics of Propaganda.” Rhetoric and Public Affairs 17, no. 1 (2014): 35-65. Kealey, E. V., “Back them up. 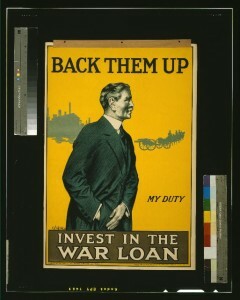 Invest in the war loan,” Hill, Siffken & Co. (L.P.A. Ltd.), Grafton Works, London, 1915 Library of Congress, http://www.loc.gov/item/2003675223/. Van Schaack, Eric, “The Coming of the Hun! American Fears of a German Invasion, 1918.” Journal of American Culture 28, no. 3 (2005): 284-292. Eric Van Schaack, The Coming of the Hun American Fears of a German Invasion, 1918, Journal of American Culture, 2015, p. 284. Hahner, Leslie, The National Committee of Patriotic Societies and the Aesthetics of Propaganda, Rhetoric and Public Affairs, pg. 39. Anderson, Benedict, Imagined Communities, Verso Press, 2006, pg. 6.